Vengeful dogs hunt for animal abusers, but they can’t do it alone. They need Native American Niko Fox. Will she let Darick Creech protect her? Niko Fox’s life changes the day massive gray dogs force her to follow them into southern Oregon’s coastal wilderness. When she spots an emaciated mare and the mare’s newborn foal, she rescues the helpless animals. Someone is responsible for the horses’ condition, someone Niko promises to make pay for the crime of animal abuse. Because of a past conflict with him, she wants nothing to do with Fish and Wildlife officer Darick Creech, but the big, compassionate man understands what the grays represent as well as she does. Darick knows she won’t stop looking for truth and justice. He vows to mend the rift between them so he can do everything possible to ensure her safety. There’s nothing personal between them, nothing to distract them from their shared goal. Or is there? Niko’s search for answers leads her to an abused dog. As she frees the animal and places it in her vehicle for a trip to the vet, the grays watch. Niko is special to them—and to the force that rules their behavior. They need her. Reader Advisory: This books contains some scenes of violence. The third book in this series offers another gritty and thought provoking look at animal cruelty and natural justice. The greys are back and this time Niko, a Native American teacher’s aide, starts to understand the Hopi origins of the vengeful dogs. There is less mystery in this third book. The dogs’ motives and methods are clear. Instead of a murder mystery, this story questions the morality of the humans who are involved with the dogs. Niko connects with the animals and she can communicate with them. While she abhors the cruelty of the dogs’ victims, she struggles to justify their brutal, feral form of justice. In this story, Niko works closely with Darick, a Fish and Wildlife officer. Theirs is a tentative friendship. There is a physical attraction between Niko and Darick but this doesn’t really read as a romance. I struggled to warm to either of these characters because they both seemed to be vehicles for the author’s ideas about animal cruelty, justice, and vengeance rather than fully dynamic characters. The supernatural element of this story is stronger than in the earlier books. There are some incredibly tense and frightening scenes and some disturbing violence. This could probably be read as a standalone novel, but I would advise readers to at least start from the second book, Fangs, for more of the background of the wolves and Niko and Darick’s world. I’ve really enjoyed this series – the concept is refreshingly original and the stories are difficult to place within a specific genre. I look forward to more from this author. 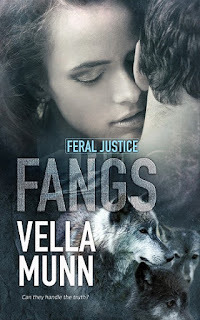 For reviews & more info, check out our Fangs post. 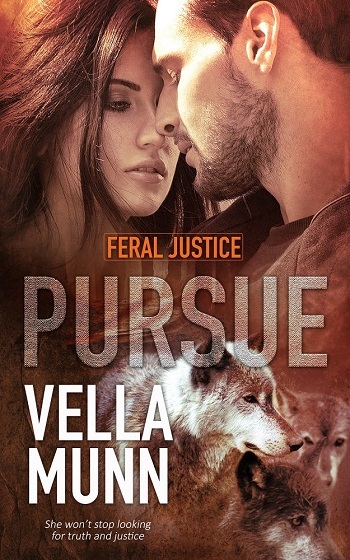 Reviewers on the Wicked Reads Review Team were provided a free copy of Pursue (Feral Justice #3) by Vella Munn to read and review.